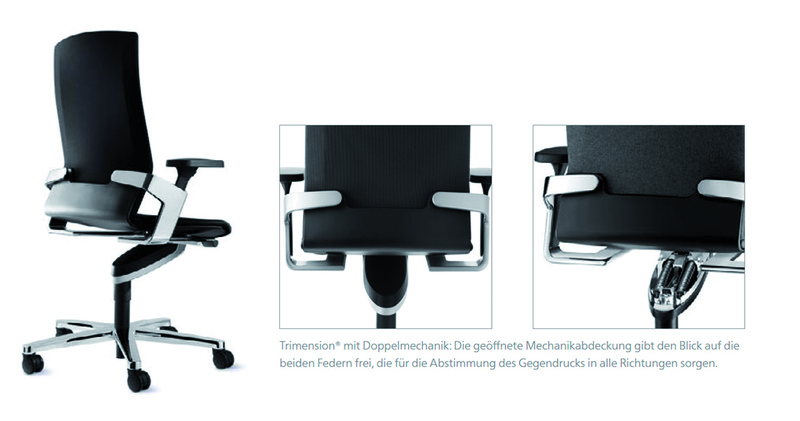 How Trimension® can now be offered to people in any type of office: three Wilkhahn free-to-move office chair ranges. Wilkhahn developed the free-to-move concept in order to combat the increasingly physically inactive style of working in digitalised office environments. A five-part series here on the blog will outline the most important background information, issues and solutions to serve as inspiration in designing workspaces that encourage more agile bodies and minds. Part 5 gives you an overview of Wilkhahn’s three office chair ranges where the concept is used. The renowned Centre for Health at the German Sport University Cologne monitored and corroborated the concept surrounding Trimension® and its impact on the body. 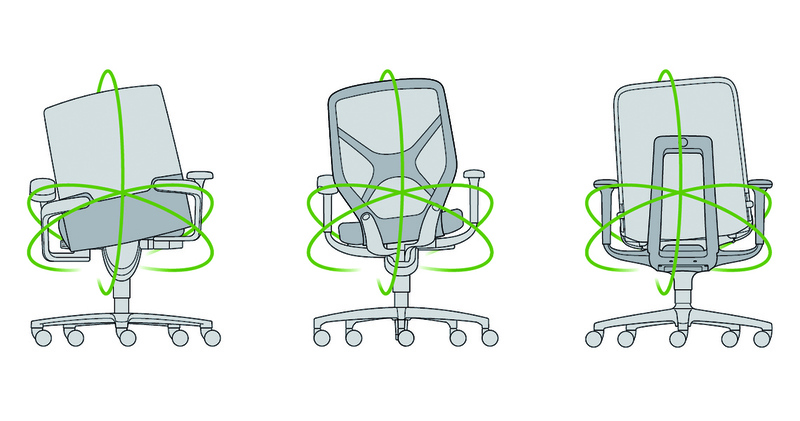 All studies prove that 3D dynamic sitting on free-to-move office chairs feels exceptionally natural and welcome! This is a key condition for making full use of the benefits. Nevertheless, there are differences in personal preferences and the demands placed by the various settings in which chairs are used. Wilkhahn developed three free-to-move office chair ranges so that people in offices everywhere can benefit from Trimension®. The ON office and conference chair: the task chair’s centrepieces are the two swivel arms that move independently of one another and the two-part mechanism. In the case of the generously sized, classically stylish ON® office and conference chair, two swivel arms that can move independently of one another with their socket joints at hip height are driven by their own spring. With just one knob at the side, both springs and therefore the counter pressure in the seat and back can be adjusted in all directions to suit users’ weights and comfort preferences. The clever part is that the counter pressure adapts synchronously to all changes of posture and movements. 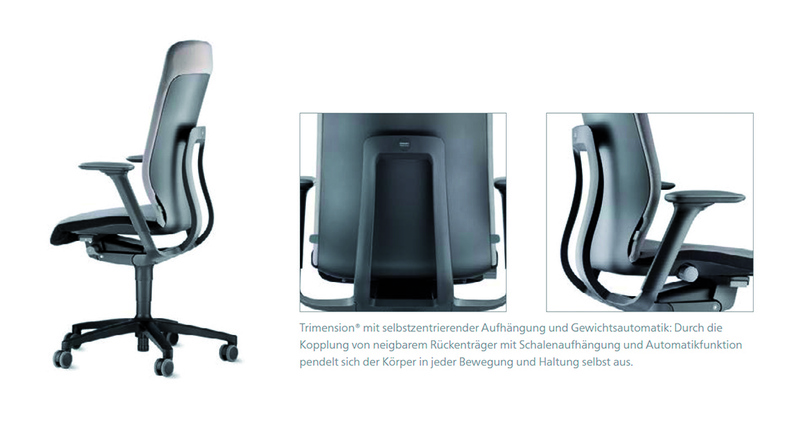 The IN office chair: 3D Trimension® kinematics for back offices. 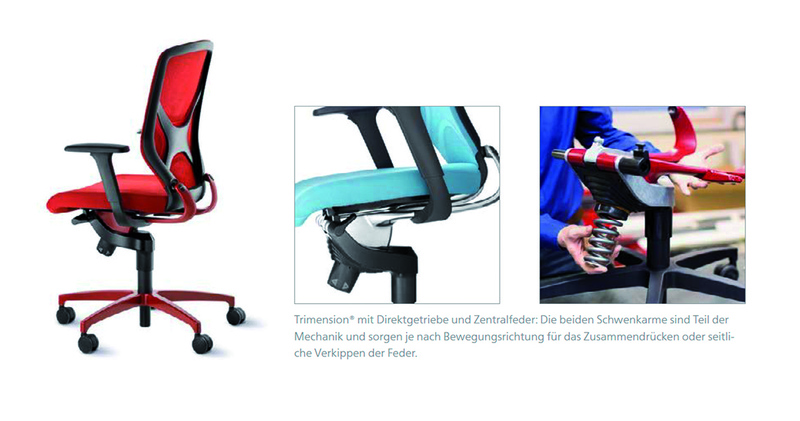 A direct control achieves the same effect in the compact, athletic and dynamic IN office chair. Also fitted with socket joints at hip height, the two swivel arms move independently of one another and are directly combined with an adjustable, flexibly mounted and enormously powerful central spring. As a result, shifts in weight are immediately translated into motion for exceptional dynamic movement that can be adjusted for people on the light or heavier side (45 – 140 kg). The AT all-rounder also comes with automatic weight adjustment, making it ideal for flexible office concepts. In the case of the smart, broadly scalable AT all-rounder, the seat and back are self-centring, swivel-mounted and suspended on the flexible backrest bearer with the body consistently maintaining its centre of gravity. As a result, Trimension® can be combined with automatic weight adjustment that doesn’t need to be adapted to the user. This is a practical feature in all flexible office concepts or where hot desking applies. In the first part of the free-to-move series you can read about the background to and causes of today’s lack of physical inactivity. What conclusions can be drawn for new sitting ergonomics? Part 2 of the series focuses on stimulating bodies and ensuring a natural range of motion as part of the new sitting ergonomics. How does the free-to-move concept help to put this into practice? Part 3 will tell you how Wilkhahn applies its patented Trimension® technology to teach sitting to walk. In part 4, we’ll be presenting three studies by the Center for Health (ZfG) that scientifically underpin the benefits of the free-to-move concept.